Whether you want a cotton candy machine for your business or you just want to host a great party, this guide will help you pick the right one. Cotton candies are a hit not only for kids. It could also be fun for adults. They’re fun to make and could really liven up the party. You could also use it at home if you just want to have fun activities with friends. If you’re curious at all about how cotton candy is made, this will be a good read on the history and mechanics of the candy making process. You might also take a lot of selfies with your guests during parties and this guide on the best selfie stick will help you find the perfect one. 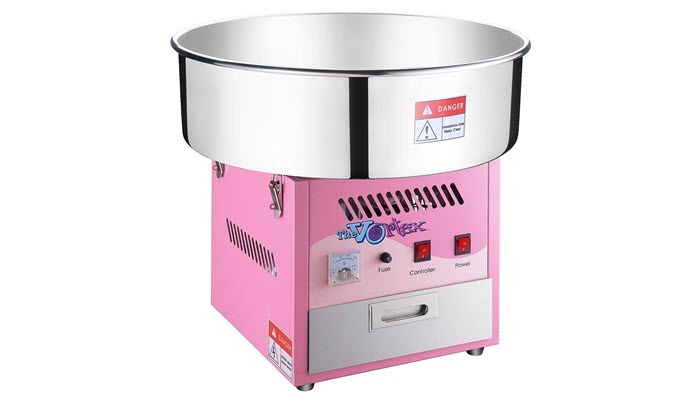 There are various kinds of cotton candy makers. Each of them offers different features. They have their own accessories for you to make the cotton candy and they come in varied designs and sizes. Finding the right one depends on where you want to use it for. 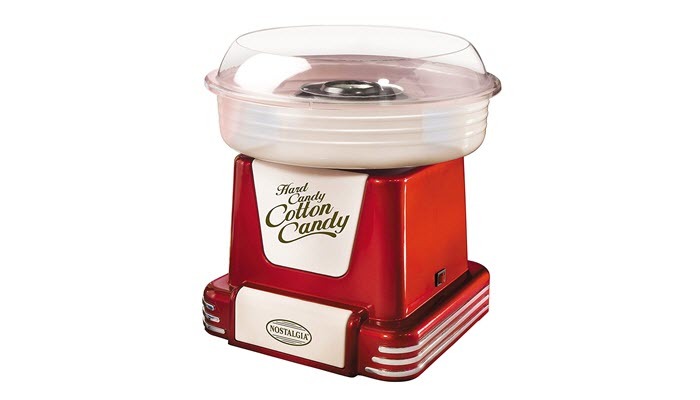 The Nostalgia Retro Series Hard Cotton Candy Maker tops our list. This is a smaller size machine that creates a fluffy cotton candy that melts in your mouth. It has an option for you to make sugar free candy so this is great for those who are watching their blood sugar. It includes a clear rim guard which makes it easy for you to see the candy making process while it is spinning. This also includes two reusable cones. The base of the machine has a suction cup to keep it stable on a cart or counter. It can be easily disassembled so it’s easy to clean and maintain. The retro design is great for any party theme. 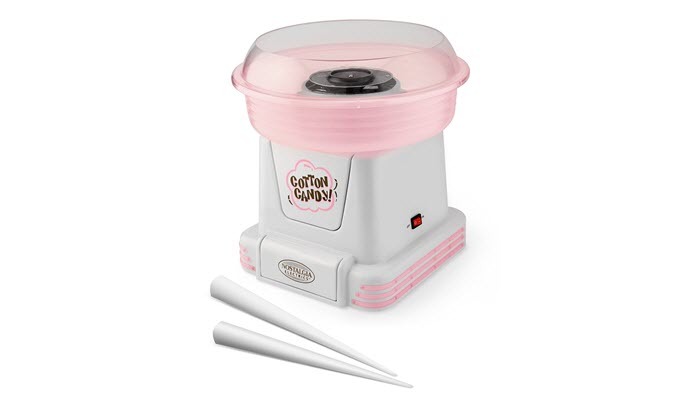 Next on our list is the Nostalgia Vintage Collection Cotton Candy Maker. This one has a cute pink base designed like a traditional cotton candy cart. 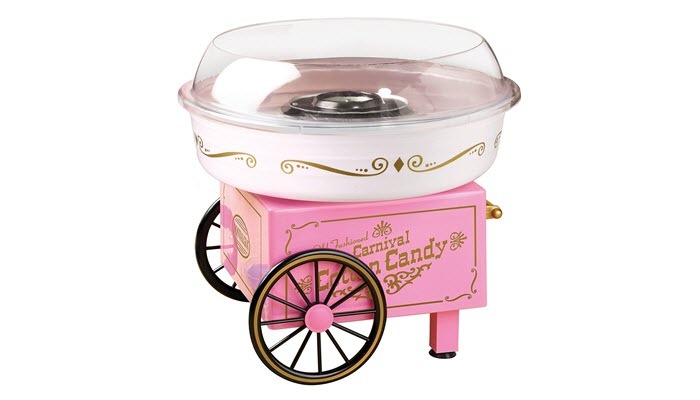 It’s a tabletop cotton candy machine that looks like the carnival vendor carts in the early 1900s. This also has the option for sugar-free candy. Use flossing sugar to create fluffy cotton candies that will be fun for your guests and the whole family. The set includes 2 reusable cones, one sugar scoop, and an extractor head. The clear rim allows you to see the candy while it is being made inside. The feet has a suction cup for stability. 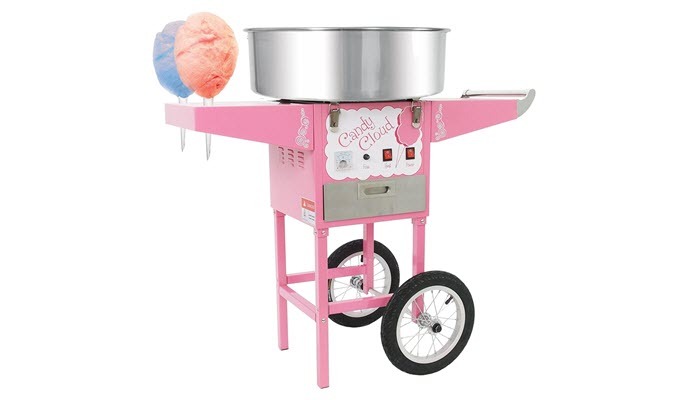 If you want something with a full sized cart, the Great Northern Flufftastic Cotton Candy Machine is a great choice. This is a commercial style machine that is great for big parties. If you want to start a cotton candy stand business, this would be perfect because it’s highly durable. The cotton candy maker is made of premium grade steel which is 30% thicker. It has a 1000 watt heating element so it can make lots of candies. Its nice antique design is great for creating a carnival or movie theater like scenery. It has a nice bright pastel color that is attractive to kids and the kids at heart. 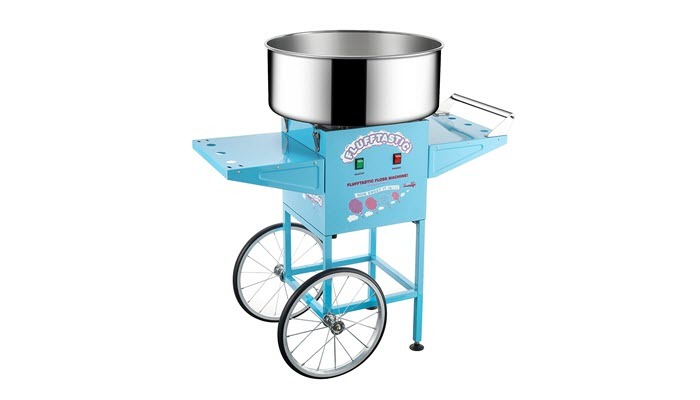 A smaller countertop version is the Great Northern Commercial Quality Cotton Candy Machine. This is also great for business it makes cotton candy fast. It can yield one cotton candy cone per 30 seconds and it works continually. This is also perfect for big parties. It’s simple to use so even beginners can operate it. Just turn on the motor and let it warm up for 2 minutes, and you’re ready to go. The machine includes a large drawer for you to store your cotton candy making accessories as well as ingredients. It has a quiet design so it will not disrupt your activities. 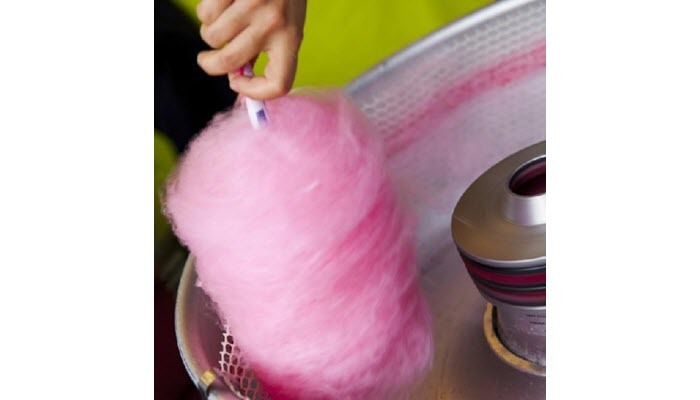 Another great choice is the Funtime Candy Cloud Cotton Candy Machine. This is also a full sized cart that is suitable for businesses and big parties. It can produce one cotton candy cone for every 30 seconds so you can serve as much as you want to your guests or customers. The cart has wheels so you can easily move it around. It’s easy to operate and has a quick startup time. The cart includes a stainless steel storage tray so you can store your scoops, cones, and other ingredients. It has a nice traditional design that would liven up your party. If you just need something for personal use, the Nostalgia PCM805 Cotton Candy Maker is an affordable option. It has a smaller design perfect for your family or a small party. You can use hard candies to make fluffy cotton candies and mix flavors if you want. You also have the option to use sugar-free candies which are great for those with diabetes. Flossing Sugar is also possible. This is a versatile small and powerful machine that is easy on the pocket. It has a nice pastel pink and white design that would look great on any counter. Choosing a cotton candy maker depends on how you want to use it and how much candy you want to make. But you also need to make sure that it’s easy to use and efficient. If you’re running a business or using the machine for big parties, you need a cotton candy maker that has a quick startup time. Ideally, this would only take about 2 minutes to heat up and start the machine. It would also be great if the machine works continuously so you can serve as much as you want. 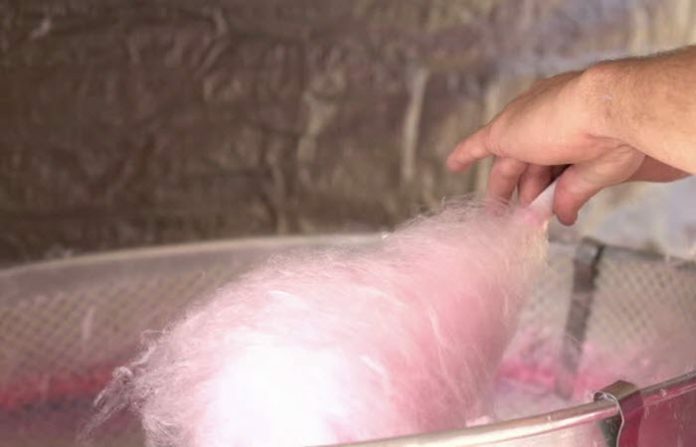 Some machines can make one cotton candy cone for as little as 30 seconds. If you expect a long line, you don’t want a machine that performs longer than that. Some machines offer sugar-free options. This means you can use sugar-free candies which are great for those with diabetes. Some machines allow you to use the hard sugar-free candies if you don’t want to use the powder type. Make sure that the machine can be disassembled for easy cleaning. It is important to maintain your cotton candy machine for it to last for a long time. There are different designs that you can choose from. Think about where you would put this machine whether in your home or in your business and choose a style that fits with your theme.